Last week was busy for a lot of reasons, not the least of which was 3 products being released into beta. I want to thank the people who have beat up Blaze so far. We really appreciate the efforts. We’re releasing a refresh to the Early Experience. When you download the refresh, uninstall any previous version you may have and reboot before you install. If you haven’t looked at Blaze, sign up to participate in the public Early Experience. Go to our website at http://www.madcapsoftware.com/products/blaze/ and sign up. We’re offering great prizes to those who find the most verified issues, such as gift certificates to Amazon. If this product is going to do what you want it to do, then we need you to help us know what that is. So go forth, download, and work with it. X-Edit allows anyone to contribute content into your Flare or Blaze workflow. Now the everyday content contributor can open your Flare or Blaze topic templates and start creating content. This allows “casual contributors” to create short documents and add content using the correct styles and other project formatting options. X-Edit Express is the free tool for reviewing content sent to you from a Flare or Blaze project. Using X-Edit Express, you can easily open topics created by the Flare or Blaze user. Depending on the options set by the Flare or Blaze user, you can annotate the topic or edit it. When you’re done, just email the topic back to the Flare or Blaze user to get your comments into the project. Go to http://www.madcapsoftware.com/products/xedit/ to sign up and download one or more of these products. X-Edit helps when you have a workflow where people are contributing content. I did a project once where I took the HR content that other people developed and put it into a help project. The people writing the content knew nothing about the tool I was using and I knew nothing about their HR policies. This is a common workflow. X-Edit lets these people just write content that they send to you. You just add their content to your project, do what indexing, etc you need to, and you’re good to go. No converting from Word, no dealing with everything in Normal and hand formatted. Just easy to import content. X-Edit Express is used in review time. Send a topic for review inside Blaze or Flare 4. The reviewer downloads the free X-Edit Express, opens the topic and makes the level of changes you allowed – either annotations or directly edit actual content. One click sends it back to you when they are done. If you want, in Blaze or Flare 4, you can define a template for your X-Edit users. This is really useful because it limits how and what formats your users can use. No more wacky formatting. They can still hand format stuff, but this should reduce that, hopefully. When you create the template, you can also specify what items are locked in the template. Why would you want to do that? Well, in our HR example, say all documents must have certain sections. You can add a locked heading for each and the users can’t delete it. The headings with the gray background are locked. The users can’t delete or change the text in them. The narrative text under each heading can be deleted and new text added. Locking headings means that you may spend less time chasing people down, reminding them that these kinds of documents need that sort of information. It’s right in the document. Templates can be stored on a network drive somewhere with a name that reflects what they are for. Then tell your users to go there and get the template for the kind of document they want to write. Wow. WritersUA is a fun crowd. Could you ask for more? Not without being greedy, I think. So, what did we announce? Blaze went to public beta Monday morning. I strongly suggest you download it and then attend one of my demos to get started with it. Team Server – a Documentation workflow management tool that goes from content to review to CMS to localization to source control. It’s going to be great. Press – a glossy print product. This one lets you have multiple article flows, automatic jump pages and more. X-Edit – a small document product for people who need to contribute content but shouldn’t have a full version of Flare or Blaze. The documents that X-Edit creates can be brought seamlessly into a Flare or Blaze project. X-Edit Express – a free reviewers tool that either edits or annotates Flare or Blaze topics. 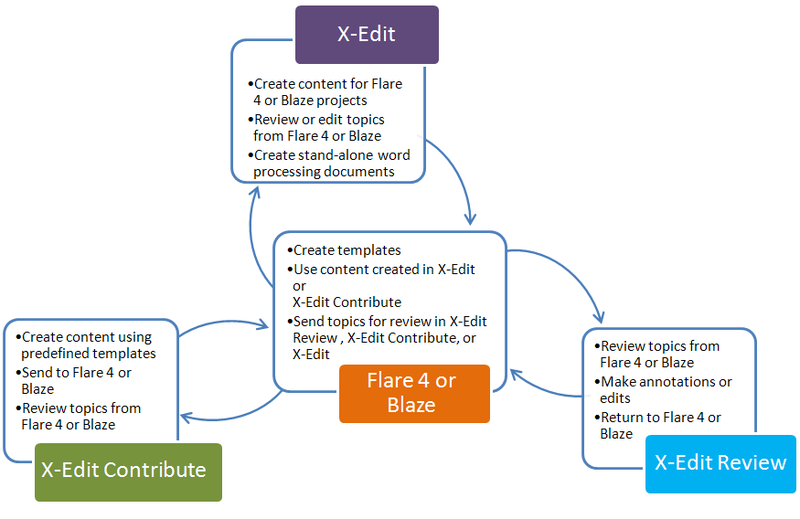 It fits into the review workflow for Blaze or Flare. New product manager – Pat Dear is our new e-learning product manager who started Sunday at the show. We figure if she floats, she’s a witch [historical reference here, no Wicca bashing intended or implied]. She’s going to add a lot to our product line with her expertise in the e-learning field. We’re happy to have her! The product I’m super excited about is Team Server. We’re working on it right now, so if you have ideas about how we can make your workflow easier, send them to me and I’ll pass them along. One of the first people I saw at the show was Eddie Van Arlesdale whose name I’m sure I’m misspelling but I can’t find the card he gave me. I met Eddie a long time ago, the first time I was in Washington DC. He’s a sweetie pie and I told him I need to come back to DC and see people there. It’s perhaps my 3rd favorite city, right after Rome and Mexico City, in that order. I also saw, in no particular order, Geoff Hart, Char James-Tanny, Sarah O’Keefe, John Hedtke, Sue Heim, Bonni Graham, Elaine Randolph, the fun Docs group for the client I saw a few weeks ago in Dallas, and way too many other people for my tired brain to remember. For a while it seemed as tho I was spending all my time hugging people. I really enjoyed it. Just so fun to see all of us in one place. I also met many new people. When the sessions were out, we were swamped with people – sometimes 15 people deep. It seemed that everyone at the conference came around to see our products and talk to us. I tried to talk to everyone but it was hard because there were just so many. Mike and I (Mike more than I) presented several products. We also drafted our Tech Writer Paul to do several demos about what Tech writers would like in Flare. He was amazing. He did stand-up comedy in the past, too, but was more successful than I was. He also works clean, which is much harder than it looks. It’s actually easier to work dirty, which is how my material goes. But Paul did a great job and I was pleased to have him helping with these. The in-booth demos were a zoo. We had people standing all over the place watching. I did 2, I think, and I enjoyed both of them. Very good stuff. I ran into some of my former staff and had a chance to talk to them and catch up. It’s good seeing them. At my former employer, I had the rare fortune of leading a very talented group of people and I miss them still. I want only the best for them and it was fun to see them and catch up. It was particularly good to run into Don, who I spent 3 months trying to fire. In the end, he was one of the most valuable employees I had and I’m glad I didn’t fire him. I was completely wrong about him and his abilities. I’ve rarely been this happy to be so wrong. He’s a very talented writer and I miss working with him. In the Starbucks, I asked and it turned out that there was an anti-war protest planned to march down our street. Portland police appeared in large numbers to make sure it was a peaceful protest, I was told. Nevertheless, I scurried back to the hotel. Then I realized that if my husband turned the TV on and saw large numbers of heavily armed SWAT teams in front of a Hilton in Portland, he might flip right out. Husbands can be so tense sometimes. I called to tell him about it. I got to the part about heavily armed SWAT teams outside and he actually asked “What did you do this time?” I think he was joking. But after they hung out for about an hour and nothing happened, they all piled on their trucks, adjusted their helmets, and left the area. Apparently, the crisis was averted. And I left for the airport 2 hours later for an uneventful flight home.